For the five Augusts in 2008-2012, Adrienne is directing a course at the Woods Hole Marine Biological Lab (MBL) called Methods in Computational Neuroscience. We met at this course when Bill Bialek was directing it, in 1998. So the little hamlet of Woods Hole, Massachussetts has some history for us. It’s on the elbow of Cape Cod, where the you catch the ferries to Martha’s Vineyard. There’s more or less one street, although surprisingly for the East Coast, there are two coffeeshops on it where it’s possible to get a proper cappuccino: Coffee Obsession and Pie in the Sky. There’s a good reason to favor Pie in the Sky: the popovers. 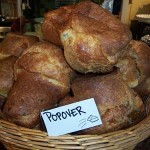 (Yes, Pie in the Sky gets one of the two citations on the Wikipedia page for popovers. No, I didn’t put it there.) A cap and a popover are really a pretty perfect breakfast. They’re like brioche, but better– fragrant, eggy, and full of voids over a wide range of lengthscales (like the rest of the universe). OK, this doesn’t get across how delicious they are. Here is my recipe, it’s very straightforward, the batter should be the viscosity of heavy cream. MIX ALL INGREDIENTS TOGETHER IN A BUCKET WITH A WHISK FOR ABOUT 2 MINUTES. IF TIME ALLOWS, LET WARM TO ROOM TEMPERATURE BEFORE BAKING. BE SURE TO PREHEAT TINS IN 350 DEGREE OVEN AND SPRAY WELL WITH CLARIFIED BUTTER BEFORE FILLING CUPS TO THE VERY RIM WITH BATTER. BAKE ABOUT 40 – 50 MINUTES @ 350, OR UNTIL BROWNED ALL OVER. Don’t take out too soon or they’ll fall!, even in my big commercial ovens, they still take about 45 minutes. Gura’s recipe has to be appreciated for its muscular details, like “mix all ingredients together in a bucket”. Gonzo breadmaking aside, a bucket really is the perfect size and shape to whisk these quantities together without making a mess. Makes batter for a dozen popovers. Caution: leave lots of room in the oven above the pan. This entry was posted in food and tagged food, recipe, restaurant, woods hole. Bookmark the permalink. Thanks so much for posting this! Did a google search for Pie in the Sky popover recipe, found your post, and just made a test batch in preparation for a brunch with friends tomorrow…..yum! 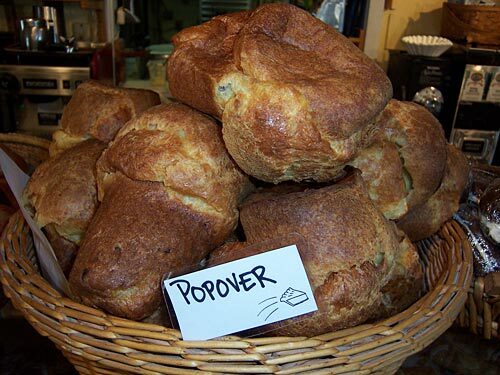 I’m a grad student at WHOI, and while I frequent Pie a good deal, my popover addiction gets a bit pricey when I feed it regularly. Now I can do it from my own kitchen!